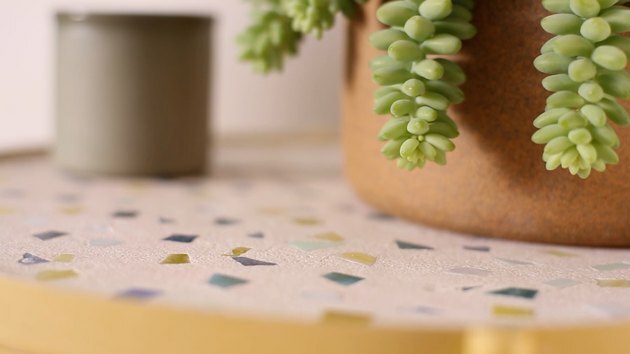 Have we mentioned just how much we're loving this terrazzo trend? Oh yeah, we have. 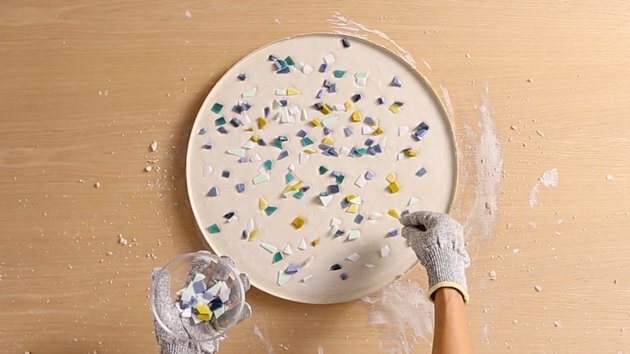 Well, now we'd like to share how you can make a one-of-a-kind terrazzo-esque piece by turning this (laughably) affordable IKEA tray table into the accent table of your dreams. 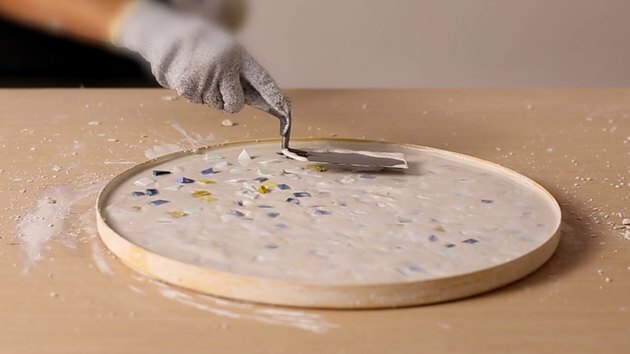 Traditionally, authentic terrazzo tabletops consist of a concrete mix of cement, sand, granite or marble chips, and strengthening nylon fibers. This special mix is poured into a custom mold fitted with a metal mesh inside for additional reinforcement. Finally, the tabletop is removed from the mold after setting and sealed with a durable epoxy resin. 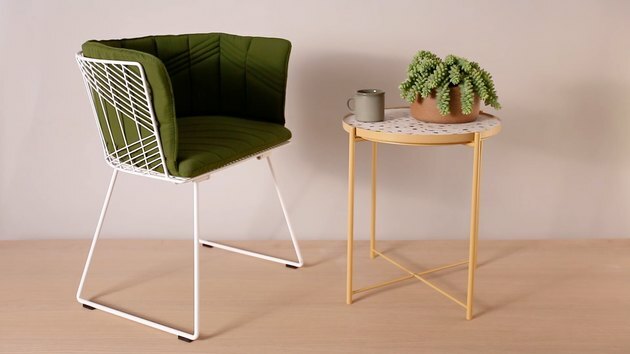 Not what we'd exactly call a doable DIY for the everyday crafter. 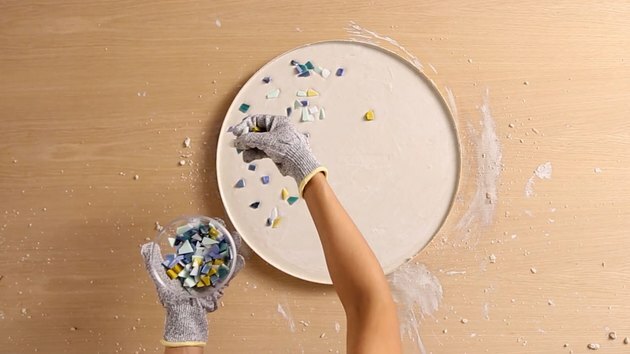 However, our super-simplified process simulates the look by adding a layer of broken glass tiles on top of a simple cement-sand mix and finishing with a wipe-on concrete countertop sealant. 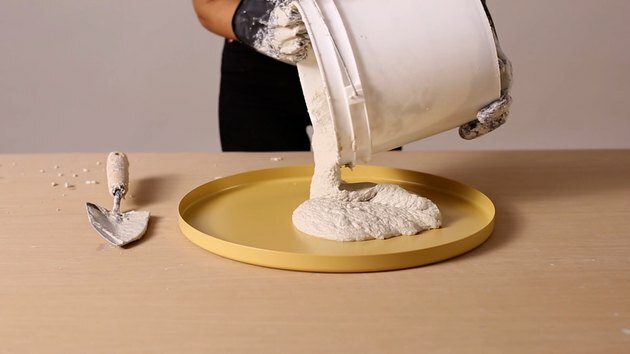 Plus, the IKEA Gladom tray is a ready-made mold that won't require additional reinforcement nor will you need to remove the concrete from it afterward. Wearing protective gloves and eyewear, use a wheeled tile cutter to cut the glass tiles/smalti into small chips of random shapes and sizes. 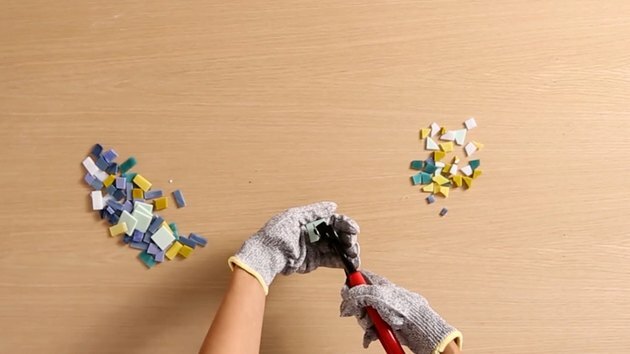 Cut enough glass to cover as much (or as little) of the tabletop as you'd like. Use more chips for a "crowded" look (i.e. more glass, less concrete), or less for a sparser, more minimalist look. (Find inspiration here.) Set glass pieces aside. 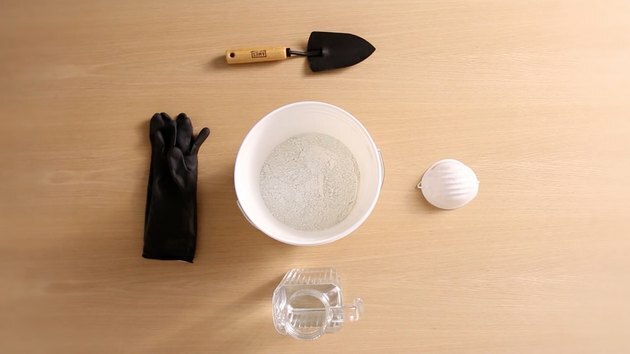 Wearing a dust mask, use an inexpensive garden trowel (you'll want to use an expendable one for this job!) 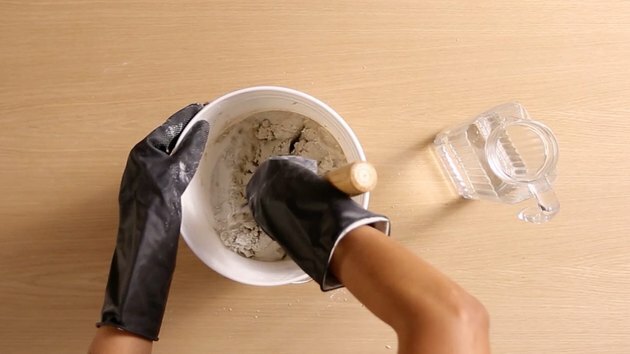 to thoroughly mix 3.5 pounds white Portland cement with 7 pounds white sand in a bucket. Add water, about 1 cup at a time, and mix thoroughly with the trowel (or cement mixer) until it's the consistency of thick cake batter. Make sure all of the dry cement at the bottom of the bucket has been incorporated into the cement and sand mix. 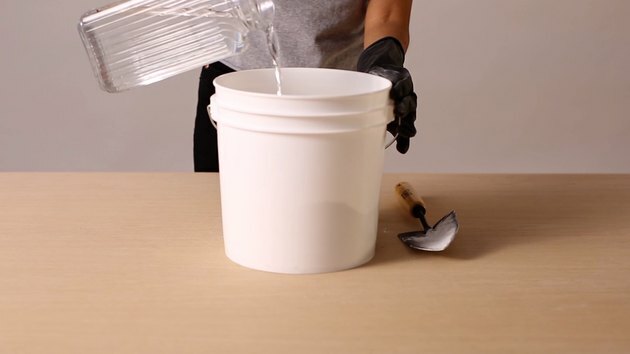 Pour into the Gladom table tray and use the masonry finishing trowel to level the top. 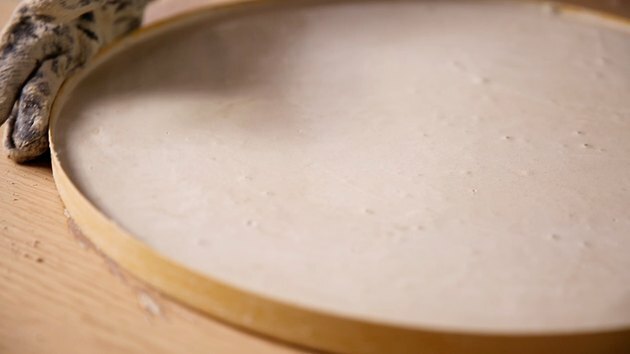 Grab the edges and shake the entire tray for several minutes to release any trapped air bubbles within the mix. Evenly spread the glass pieces over the wet cement. 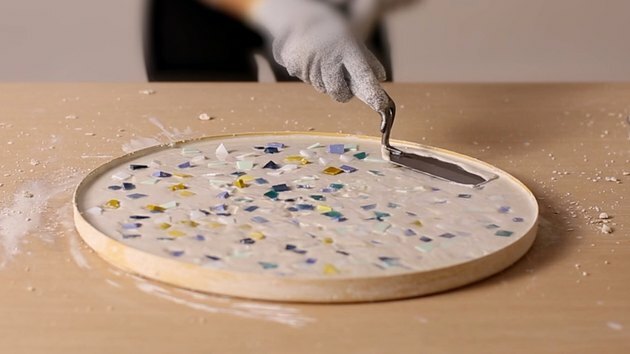 Use the finishing trowel to press the glass pieces down and smooth the surface. Doing so will create a thin film of cement over the glass to be sanded down later. Wait until partially set — about 24 hours. 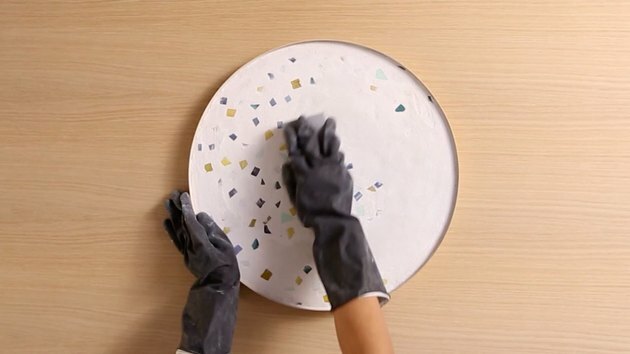 Wearing a dust mask, sand the tabletop with medium- to coarse-grit sandpaper (80-100 grit) to remove the top film of cement and reveal the glass. Now, sand with fine-grit sandpaper (about 200 grit) to smooth. Wait another 24 hours or until cement is completely set. 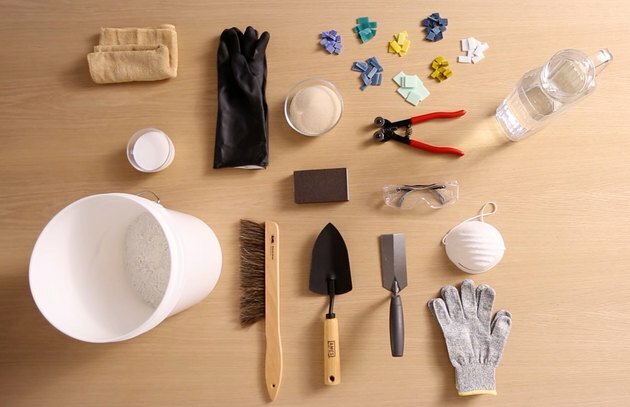 Thoroughly clean off any remaining dust from sanding and apply one or two coats of food-safe concrete countertop sealer in a well-ventilated area, according to the manufacturer instructions. 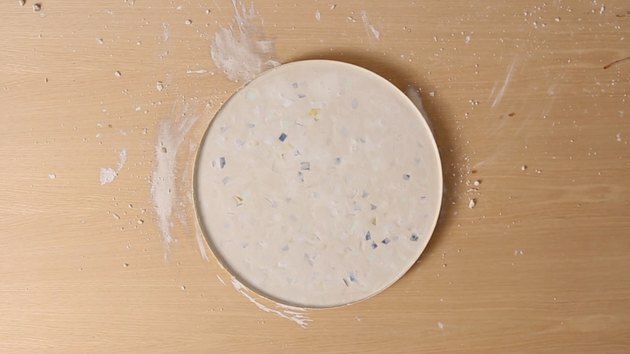 Let dry completely before using your chic terrazzo-inspired table!